If you would like to schedule your pup for an exam with our team of expert vets, begin a canine wellness program, or find out if they are a candidate for pet surgery, call Sun Valley Animal Center to arrange your visit to our renowned animal care facility in Idaho. In the meantime, here are four more tips for managing your dog’s joint health. Canine obesity contributes to joint problems in dogs. An article in The Journal of Nutrition confirms the definitive link between canine obesity and the detrimental effects it can have on the health, longevity, and overall quality of life of dogs. The study suggests the main cause of canine obesity, aside from some certain diseases, as being from the imbalance of energy intake and energy expenditure; eating excessive amounts of food (energy intake) and not getting enough exercise (energy expenditure). Therefore, it is essential, not only for your dog’s joint health, but for their overall health, to feed them healthy proportions of nutritious foods and give them plenty of exercise, walks, and playtime. Dogs are constantly on the move, which puts them at risk of injuries. Then, you add the threat of being hit by cars, getting into fights with other dogs, getting into something they shouldn’t, or landing wrong when catching the frisbee, and that risk is increased. The trouble with dogs is they hide their injuries very well. This stems from their natural survival instincts. Unfortunately, this can make it difficult to spot an injury. Be aware of your dog’s movements and behaviors and if you suspect — or know for certain — they’ve been injured, have their injury treated immediately. While some injuries can lead to chronic joint problems, untreated injuries are more likely to cause your dog long-lasting pain and reduce their quality of life. Does your dog sleep in bed with you? Do you let them curl up on the couch with you? Do have stairs in your home? 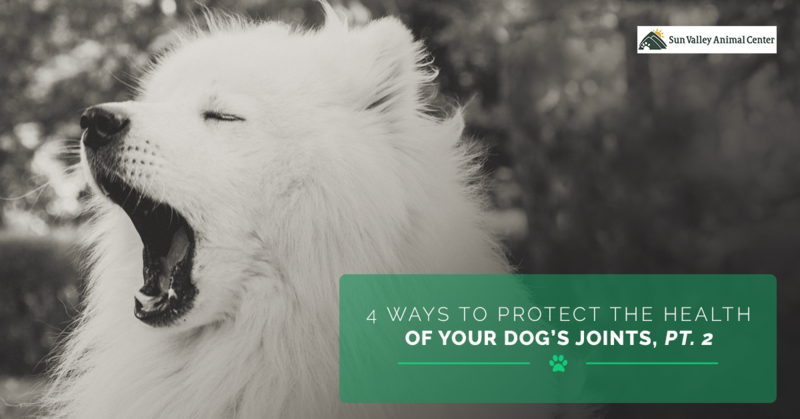 There are ways to make your home joint-friendly to take the stress of your pup’s joints. Give them a ramp or doggy steps to get up on the bed or couch with ease. Create their main environment in an area where they won’t have to go up and down stairs regularly. Use baby gates to limit their stair use. Check back for a future blog offering tips for creating an environment in your home that is easy on your dog’s joints. Being aware of your dog’s joint health early in their life can reduce the risk of joint problems in their senior years. Talk to your veterinarian about nutritional recommendations, dietary supplements, and exercises to strengthen their joints. Learn more about canine wellness programs that combine different therapies to ensure the health of your dog’s joints. Being a proactive pet parent is the best way you can improve your dog’s health, longevity, and quality of life. Visit Sun Valley Animal Center to learn more about our routine exams, the East Meets West Wellness Center, or to find out if your dog is a candidate for pet surgery to repair damaged joints.